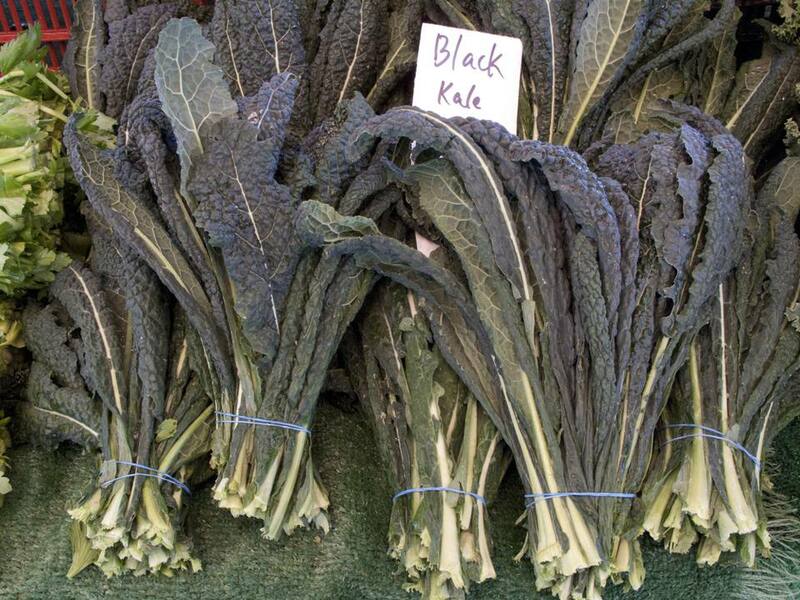 Dinosaur kale--known as dino kale, Tuscan kale, lacinato kale, black kale, or cavolo nero--is an incredibly hearty cooking green with dark almost blue-green or even black-green leaves and lots of earthy, nutty flavor. The leaves are so hearty that even when well-cooked they retain a wonderful firm texture, meaning they're great for braising or adding to stews. Look at the leaves carefully; you want very dark blue-green or black-green leaves with no brown or wilted bits. Check the stem ends—they should look freshly cut, not dried out or browned, or, even worse, slimy, either of which betrays that the greens were harvested some time ago. Depending on how you're going to use the kale, you may choose to look for bunches that have wider or more narrow leaves. If you want to cook it whole, choose kale with thinner stems, if you can, for more even cooking. Store dino kale loosely wrapped in plastic in the fridge. Unlike more tender greens, dino kale doesn't store better if washed first so you can put off that task until you're ready to use it. When ready to use, be sure to rinse the leaves well. The leaves are so sturdy that you don't need to be nearly as careful to avoid bruising and crushing as with other greens. There's no need to beat them up, but also no need to place them tenderly on top of the bag for the trip home. One of the advantages of this hearty green is its ability to take a bit of handling without damaging results. Dino kale is particularly well suited to braising in a bit of broth—simply heat a pan, add a little bit of broth, add the cleaned and chopped kale, cover, and cook over gentle heat until the leaves are wilted and tender. Another simple option is to sauté it in olive oil with garlic and a chile or two if you like. A sprinkle of salt and a squirt of lemon are nice, too. If you find that kale has a bit more of a bitter edge than you care for, try blanching it before using it in the recipes above. Blanching is simply quickly cooking a fruit or vegetable in salted boiling water. For dino kale, put whole or chopped leaves in salted boiling water for about 1 minute, drain, rinse with cold water to cool off, and use your hands to squeeze as much water out of it as possible. This process will leech out much of the bitterness. Will you lose some vitamins along the way? Yes, but if blanching helps you eat more kale, that trade-off may well be worth it!